It sat alone and shiny in a random, deserted parking lot. A 22-foot-long Airstream trailer from 1961. Its silver coat glistened in the afternoon sun. Its shape curved and retro like a spaceship from the past. When I saw the For Sale sign posted on the back window, I literally jumped up with excitement. This beautiful adventure on wheels could actually be mine? I started to envision the road trips: Mountain bikes strapped to the back, long treks around Utah and Colorado, picturesque campsites along rivers and lakes. It was love at first sight. And then, the price tag: $23,950. My heart sank. Who could afford to spend that much on a historic artifact that was basically a souped-up tent? Not me, that was for sure. The enchanting road trips I had planned in my head evaporated as quickly as they arrived. That moment marked the beginning of my Airstream obsession. I knew it was something I couldn’t have, and that made it all the more tantalizing. I bookmarked a website dedicated to refurbishing vintage Airstreams. I’d do double takes on the highway when I’d pass a 16-foot Bambi from the 1950s. I would stare enviously at the driver on my way by. In the middle of a road bike race, I passed a house with three vintage tin-can trailers parked out front. I almost veered my bicycle off the road due to my Airstream rubbernecking. While driving across Utah, I convinced my driving partner that it was worth it to head over 200 miles out of our way to spend the night at a hotel whose accommodations were eight custom-designed Airstreams. But when I called with baited breath to make a reservation, the owner told me the place was closed for the season. “Check back in April,” he said. It was December. My head hung low. We stayed at some crappy motel off the highway instead. On a spring ski trip to Mammoth, I called an Airstream delivery company in southern California (yes, those exist) to see how much it would cost to have them drop an Airstream for us at the campground in Mammoth Lakes. It’d be over $500 a night. “Forget it,” I said, while hanging up the phone. Perhaps it wasn’t meant to be. Maybe I’d never get a chance to sleep in a silver-sided trailer. 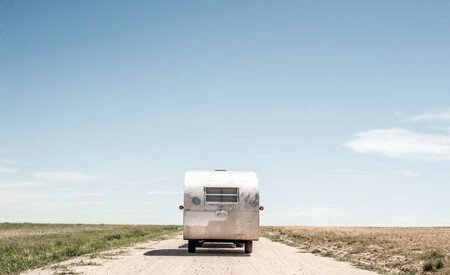 I appeased myself by figuring that I could afford a vintage Airstream when I retire, in a mere 30 or 40 years from now. Eventually, the thought dawned on me: The appeal wasn’t so much the trailer itself—although I loved those clean lines, iconic style and shimmering aesthetic—but the escapes I knew the trailer would bring. Once I realized that, I figured out that I didn’t actually need the trailer. I had a car, a tent and friends who love to explore. I had everything I needed to pursue the dream on my own, sans trailer.